The federal sentencing hearing of an ex-police officer who pleaded guilty in May to violating the civil rights of an unarmed black man, Walter Scott, began Monday in South Carolina. The officer, 36-year-old Michael Slager, shot Scott to death while he was running away from the officer in North Charleston on April 4, 2015. Scott had been stopped for a broken tail light. Scott’s killing, which went viral after it was captured on the cell phone camera of a bystander, became one of several that galvanized the Black Lives Matter movement and sparked protests across the country over the perception that police officers mistreat black people. Slager was charged with first-degree murder in Scott’s death, though a judge declared a mistrial in that case last December after a jury was unable to reach a unanimous verdict. Slager, who pleaded guilty to violating Scott’s civil rights for fatally shooting him with no justification, faces a maximum of life in prison. His sentencing hearing could last several days. Among the first to testify at Monday’s hearing was the bystander, Feidin Santana, who said that he never saw Scott try to wrestle away Slager’s Taser in the open field where he was shot dead — contrary to Slager’s account of the incident, according to Harve Jacobs, a reporter with NBC affiliate WIS-TV. Slager has said that he feared for his life during the encounter. "I saw that Taser coming at me and I knew I was in trouble," the former cop said during a court hearing in November 2016. "I knew I was overpowered." On Monday, however, Santana said it appeared that Scott was only trying to flee the scene, Jacobs reported. When he did, Santana added, he heard gunshots and saw Scott tumble to the ground, according to Jacobs. 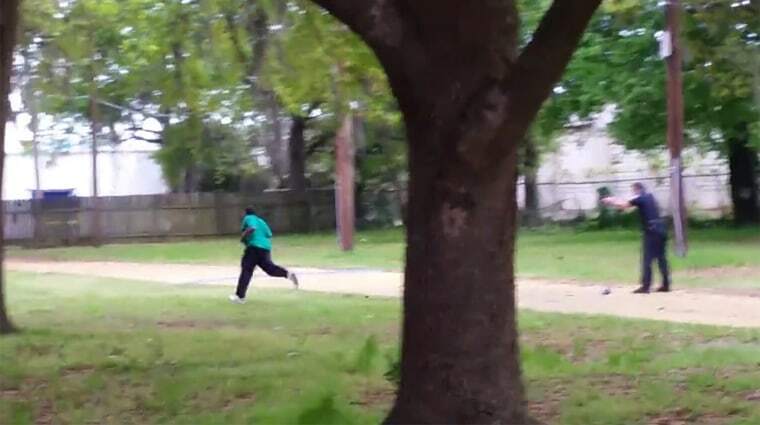 Slager fired eight shots at Scott as he ran away, striking him five times. Scott’s relatives have said that he probably ran because he owed back-child support payments and didn’t want to be arrested.